Our organisation is instrumental in providing a comprehensive array of Glass Connectors NGC-1. We make sure that these products are manufactured using best quality raw material, which is procured from the most trustworthy vendors of the respective domain. Further, patrons can avail these products in customized forms as per their exact laid down specifications. 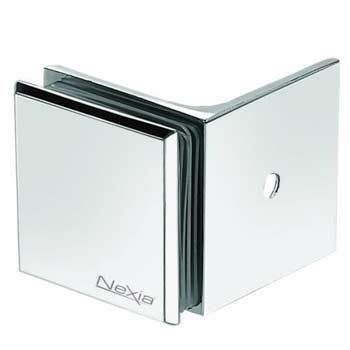 Since establishment, GANESH TRADERS ( Now Nexia Overseas Co. ) has already carved itself an enviable niche in Architectural Hardware and Glass world under the brand name Nexia. A vital components of glass fitting are the quality products that keeps your glass fitting functioning properly and reliable for a long time choosing quality products of Nexia brand is always the correct decision for you and your customers. The essence of the quality embodied by “ Nexia Overseas Co.” is made up by a number of values :- precision, longevity, functionality, design and environment consciousness complement each other to create a complex products philosophy. Our company is always in the habit of doing research work and consultancy and from time to time used to bring new products in respect of glass fittings. Our market oriented range of products comprises of patch fitting, floor springs, shower hinges, spider fitting, canopy fitting, weather seal, shower knight head accessories, manual sliding system, swing glass fitting, glass connector, automatic door sensor, frame less wire shelving system, vacuum lifter and many more providing a wide variety of uses for the customer. Nexia Overseas Co. is proud to present their NEW CATALOGUE Nexia which has all products of comfort and reliable for glass fitting and structural glazing fitting and showing installation details of each products and customer satisfaction is our prime objective and to keep on improving an quality service and products is our motto for our customers to come back to us for quality and guarantee and be a part of Nexia. We guarantee superior quality and timely delivery with the desire of serving users whole heartedly and making customers completely satisfies our Nexia brand products are not only highly commented by users in Indian and also unanimously recognized by clients in so many other countries of the world.